What about this for a resting place! Inspired by fellow contributors and Paddy Dillon's book "The Mountains of Ireland: A guide to walking the summits" I decided to set out to conquer the Paps on a fine late September day. I walked along the trail mentioned in the previous posts beyond yet another gate and climbed up a heathery slope thereby avoiding the now notorious fire break. Going was steep and probably a good deal drier than the fire break but with dense heather it can be treacherous in places on the descent. 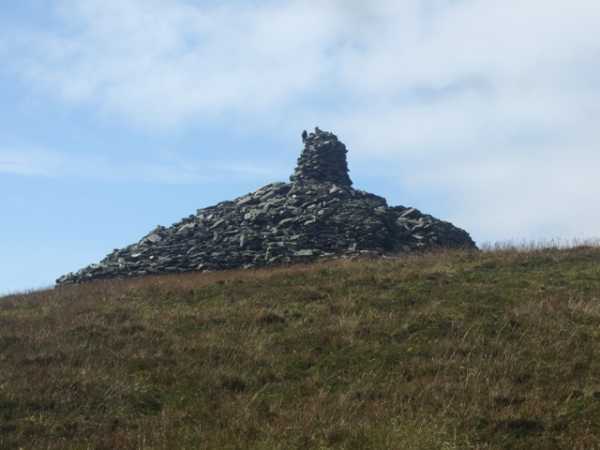 I noticed a couple of birds of prey on the cairn on the summit-(see photo). The two birds circled the summit as I approached. Can anyone identify this creature- apparently mostly black with a long wing span?